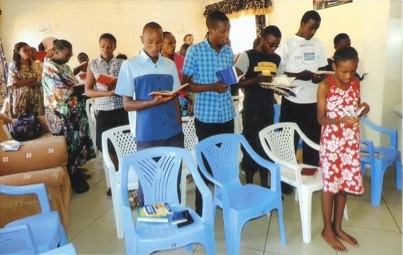 "Milimani church plant has been meeting in a primary school, though this meeting place has not been the most conducive for our purposes. The Lord, whose hand is not short, brought HeartCry Missionary Society and other brethren to provide necessary support, so that I can rent a house in Milimani. We are thankful to God who has allowed my family to relocate to the area we are trying to reach. This has been our prayer since we were sent to this part of the town. We are now settling down in our new residence, which has not only benefited my family but the fellowship in Milimani as well. Our home has also turned into a meeting place for the fellowship. We are now meeting in our living room, as you can see in the photo. During this church meeting in our house, adults were about 38 and children 12 in number. HeartCry was able to give money to buy the needful things like seats and other things that will be used during the services. May God bless HeartCry Mission and our mother church, Grace Baptist Church Kisumu, for the support they have been providing for this fellowship. I have been doing Bible study through the book of Acts; we are in chapter twenty-one. This book is wonderful, especially when I see how the Apostles suffered for the gospel’s sake. We need God’s grace to work for Him in this sinful world. I have really been challenged by this book, both as a pastor and a family man. This book has motivated us to do evangelism in the surrounding area even more than before, and so far the response is good. A man recently joined us whose name is Martin. Do pray for Him. May we not be ashamed to give the account of struggles and even failures in our new station so that you may pray for us. This place is for the high class of town, those who think they don’t need the gospel. All these homes are closed and nobody greets one other. They live for themselves and think the gospel is for the poor and uneducated of the society. Life is not easy here compared to where we came from. Do pray for both these people and the fellowship so that we may reach them with the gospel of grace.